Smart NaMo has unveiled the pricing of two NaMo series phones on their Facebook page The Smart NaMo Saffron 2 appears to be the Smart Namo Phablet which was unveiled few weeks back, and Smart NaMo Saffron 1 is other new phone in this series with promising features. Saffron 1 has been priced at Rs. 18,000 INR and Rs 23,000 INR for 16 GB and 32 GB variants. Namo 2 has been priced for Rs. 24,000 INR which is a little higher than what was previously specified. 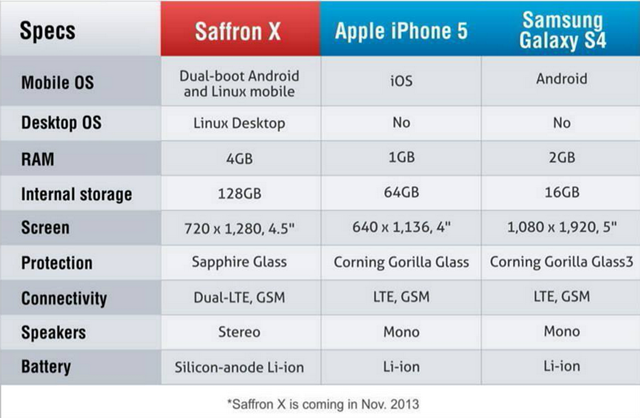 Another phone Saffron X in the same series was also revealed in another pic and has been disclosed to be released in November 2013. 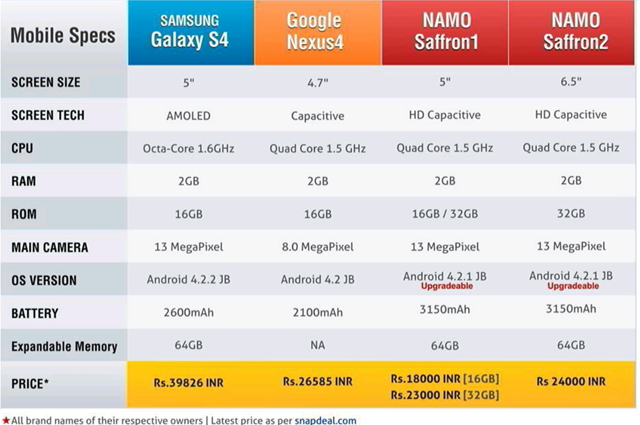 Let’s take a look at the hardware specifications of these smartphones. NaMo Saffron 1 sports a 5 Inch capacitive display, whose resolution has not yet been specified. This phone will be powered by MT6589T Turbo quad core processor clocked at a frequency of 1.5 GHz. The RAM capacity is 2 GB which is pretty good; The Internal storage will vary as 16 GB and 32 GB in two separate variants. The primary camera is 13 MP and the secondary camera specifications have not been mentioned. The battery capacity is 3150 mAh and the Android 4.1 Jelly bean operating system is upgradable. NaMo Saffron 2 will have a bigger 6.5 inch Display and has been priced at 24,000 INR. All the other hardware specifications remain same as Saffron 1 and only 32 GB Internal storage variant will be available for this one.We expect the battery backup to be reduced significantly because of the larger display in this Phablet. You can also read Smart NaMo Phablet Quick Review for further insight. Saffron X will be Dual boot Android and Linux smartphone. Its desktop o.s. will be Linux. The RAM capacity is huge at 4 GB and matched the 128 GB Internal Storage on board. The display is 4 .5 Inch in size and has 720p HD resolution. The processor or camera specifications have not been mentioned. The picture on the Facebook page brazenly compares NaMo phones to accomplished devices like Samsung Galaxy S4 , iPhone 5 and Google Nexus 4. How close these claims are to truth will be only known when the devices are available for purchase, which has been consistently delayed for quite some time now.